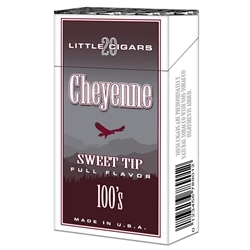 Cheyenne Sweet Tip Filtered Cigars are available in Box 100's and packaged 20 cigars per pack, 10 packs to a carton for a total of 200 premium filtered cigars. Cheyenne Filtered Cigars are very popular among filtered cigar enthusiasts. Each of the Cheyenne's have a rich-tasting premium tobacco blend that will provide you with an enjoyable smoke each and every time you want it!